I believe some of you once mentioned dandruff and/or yeast issues. I have heard other people mention this on other forums. Of course, dandruff can be a symptom of too much yeast on the scalp and around the follicle. Ketoconazole 2% shampoo is often prescribed for this. Ketoconazole can be prescribed in other forms, but basically, it is an anti-fungal. I recently read that people are using Monistat-7 cream to control scalp fungus and regrow their hair. Monistat (Miconazole) is also an anti-fungal and is in the same family as Ketoconazole. Monistat is usually used to treat a vaginal yeast infection internally/externally. It kills the yeast, relieves the itch, and decreases inflammation. It is believed that Monistat7 has the same affect on the scalp, but it is also a DHT blocker. It kills the scalp fungus around and within the follicle leaves the hair shaft more room to grow and more room for oxygenation/circulation. I couldn't find any clinical trials on it, but a lot of people are giving testimonials. I don't have scalp fungus, but it kind of makes sense to me how this might help someone with a lot of scalp fungus. On the other hand, there is the Metrocream (metronidazole) which is an antibiotic. This will kill the bacteria on your scalp. It is also known to decrease inflammation. Why does it matter? Well maybe it doesn't, but I find it terribly interesting that metronidazole and miconazole, two medications that are used to regulate vaginal flora, are also able regulate scalp flora, decrease inflammation, and possibly promote growth. I also think it is important to recognize any connections between symptoms and obvious changes in flora. For example, if you are given Diflucan tablet for a vaginal yeast infection, how does it affect your scalp, feet, or other places where fungi are know to thrive. If yeast is a huge problem, what modifications can you make on your own to decrease it? Yeast seem to love a sugary/starchy diet - try paleo diet. What happens when you take Doxycycline capsules for alopecia while using Ketoconazole or any other antifungal and use Rogaine? Would you have decreased the inflammation in two ways allowing the Rogaine to be more effective? 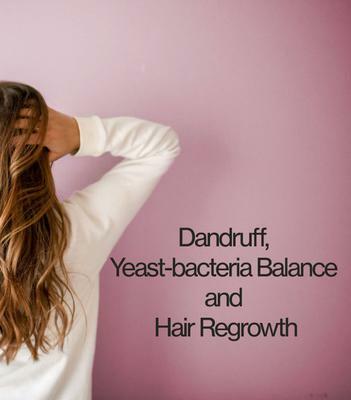 Basically, the bacteria-yeast balance may be a major factor in hair growth. It might be worth discussing with your doctor.